There are tons of weapons in the world of Red Dead Redemption 2, but we've got a list of the best ones right here. You start out with some fairly weak weapons in Red Dead Redemption 2, and you're going to want to get your hands on some new guns as soon as you can. Well in this Red Dead Redemption 2 best guns guide, we'll be detailing a full list of all the best pistols, shotguns, rifles, and more in Rockstar's wild west prequel. If you instead need any other details on the latest from Rockstar Games, you’ll want to head over to our Red Dead Redemption 2 guides hub. Here you can find a beginner’s guide, detailed tips and tricks, and much more. Just below, we’ll be listing out all the rare and powerful weapons that we’ve found so far in our time with Red Dead Redemption 2. Keep in mind that since the game is absolutely colossal, we likely won’t have found every one of the best guns in Red Dead 2, and we’ll be updating this guide whenever we find a new weapon of note. These Red Dead Redemption 2 weapons include those obtained through Gunslinger missions. These are the best weapons in Red Dead Redemption 2. We'll update this list as we find more, but these should give you the upperhand in any shootouts you encounter in the game. Although Midnight's Pistol is certainly the more fancy weapon, the Semi Automatic Pistol is the more deadly weapon. As you can probably imagine, it's got one of the highest rates of fire of any weapon in the entire game, and it can be deadly in merely two hits, even from range. To purchase it, simply head to the nearest Gunsmith on the map. The title of best rifle in Red Dead Redemption 2 could be awarded to the Springfield Rifle, but we'd have to choose the Lichfield Rifle due to its higher fire rate. It's a rifle that certainly packs a punch, while not sacrificing fire rate for accuracy or range. To obtain the Lichfield Rifle for Arthur Morgan, simply purchase it from any Gunsmith for $145. This isn't a unique weapon per se, but it's worth noting that you'll only be able to unlock the Carcano Rifle through story progression. If you're wondering why the powerful rifle isn't available for purchase during the main game, it's because it's locked behind Micah's story mission early into Chapter 6, which takes place in the Van Horn Trading Post. Complete this mission, and the Carcano Rifle will be yours to keep. Alternatively, during the Magician’s for Sport mission earlier on in Red Dead Redemption 2, you can obtain the Rare Rolling Block Rifle. In the story mission, you’re going to have to rescue Josiah Trelawny, and then track down several bandits in a small corn field. After you’re done with the corn field section, you’ll be tasked to take out a number of bandits that are hiding out in a nearby barn. One of these bandits drops the Rare Rolling Block Rifle, and this is your only chance at obtaining the rare sniper rifle. 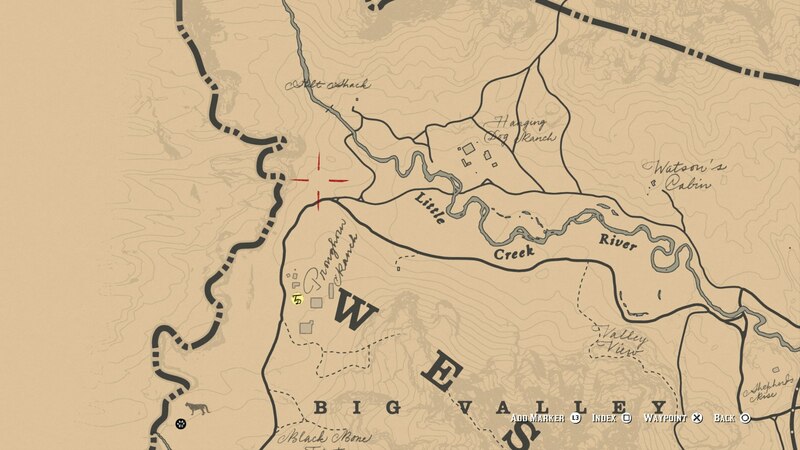 Just west of Hanging Dog Ranch, which is itself north of Big Valley, there lies a cave on the edge of the map. Within this cave is a rather odd individual with the rare shotgun, which looks the part and packs a punch. The Stone Hatchet is a unique weapon that doesn’t come from a Gunslinger, but comes instead from challenges in GTA Online. While you’re playing GTA Online, you’ll get a text message from Maude Eccles, asking you to bring in five bounty targets in total. Complete this entire quest line (which isn’t too tricky), and you’ll unlock the Stone Hatchet in both GTA Online and Red Dead Redemption 2. The weapons obtained by completing Gunslinger missions in Red Dead Redemption 2 aren't always the best, but we've rounded up a few of the better ones in this section of our weapons guide. During the course of the Gunslinger side quests, you’re going to come across an elite cowboy named Billy Midnight. You can kill him to obtain Midnight’s Pistol, which is basically an elite version of the already pretty powerful Mauser pistol. For a walkthrough of where to find Billy Midnight, head over to our Red Dead Redemption 2 Gunslinger guide. Guess what? Flaco’s Revolver is another Gunslinger weapon. It’s by no means the absolute best revolver in the game, but it’s still capable of packing a punch from a distance. For a guide to the location of Flaco Hernandez, check out our Red Dead Redemption 2 Gunslinger guide. This brings us to the end of our Red Dead Redemption 2 guide on how to locate some of the best and unique weapons in the game, but as we previously mentioned, we’ll be updating this guide whenever we come across any new weapons of note. For now, you can head over to our Red Dead Redemption 2 Honor guide, or our page on how to dual wield in Red Dead Redemption 2 for more.